The Department of Corrections will have less money to spend during the next two years than it had available in the past two years. The agency‘s new budget adopted by the 2011 Legislature also contains lower funding than the governor requested at the start of the legislative session in January. "We face a significant challenge trying to operate a corrections system for more than 13,000 offenders with fewer dollars than we have now," said Corrections Director Mike Ferriter. "The cost of everything continues to rise – from meals for inmates to utilities to medical costs." The total budget for the two years beginning July 1 is $351.6 million, compared with a current two-year budget of $355.2 million. The budget also is $13.1 million (3.6 percent) less than Gov. Brian Schweitzer wanted. The first year‘s budget is $174.2 million and the second year‘s budget is $177.4 million. The appropriation excludes funding for 27employee positions, although most of those jobs are vacant. "I believe legislators listened to us and understood our needs," Ferriter said. ―No one challenged our offender population projections." The budget contains money for up to 120 additional secure beds and 54 more community corrections beds. Lawmakers funded the bulk of the department‘s request for additional prison capacity, providing about $3 million for up to 100 conventional prison beds and 20 beds for inmates requiring some level of assisted living because of medical or physical problems. But the budget does not fund 44 additional prison beds that were part of the department‘s request. For community corrections, the budget contains $3.6 million for 20 additional beds in existing prerelease centers and 34 more beds in alternative programs such as treatment centers and revocation and sanction centers. However, the budget lacks funding for 20 more prerelease beds that had been requested. The Legislature also declined to renew funding for a prerelease center in Northwest Montana. No decisions have yet been made on development of the increased capacity in the prison and community corrections sys-tems. The money for the new prison beds will not be available until after the middle of next year. 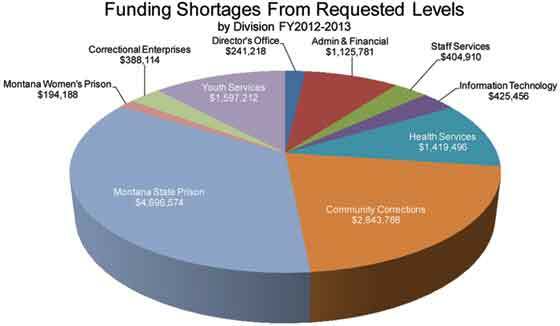 Other major shortages in the budget include $1.1 million in funding to cover the cost of providing medical care for in-mates outside of prison, $500,000 for 11 existing contracts, $200,000 to maintain mental health technicians at Montana State Prison, $400,000 for equipment and vehicles at the Deer Lodge prison, and $210,000 to cover utility increases at three correctional facilities. The end result is that the department must look for ways to mitigate an expected $13.1 million shortage during the next two years. "We plan do all we can to reduce that amount by looking for ways to get by with even less than we have now, Ferriter said. But I am concerned about our ability to address the entire amount given our inability to control the number and types of offenders we receive from the courts." "We advised the Legislature on numer-ous occasions that inadequately funding the department could result in us having to request a supplemental appropriation from the next Legislature," he noted. "We will work hard to prevent that from happen-ing." In addition to shortages in funding for programs and services, the budget holds no money for employee pay increases. That means the two-year pay freeze im-plemented by the 2009 session will ex-pand to a four-year freeze. "I know this is a difficult issue for our employees, but I am confident they will maintain their reputation as hard-working dedicated professionals," Ferriter said. "They will con-tinue to make public safety a top priority and continue to serve the people of Montana well."